Loosening your curl pattern offers styling options. 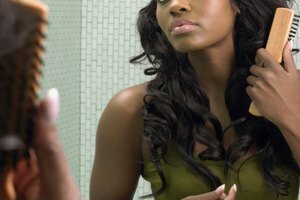 If you have naturally curly hair, you may have noticed that your hair "shrinks" or appears shorter after you've shampooed and conditioned your curls. Loosening, commonly referred to as stretching, your curl pattern makes your hair look longer and fuller. Stretching your curls also expands your styling options, and it's a good way to alter your curl pattern without using any heat. You don't have to worry about damage or permanently altering your curl pattern because your hair reverts to its natural pattern and texture when you wet it. Rinse all the shampoo from your hair. Wet your hair all over and then shampoo. Create a lather and work the shampoo over your scalp and hair. Rinse the shampoo. Repeat the lather-and-rinse process one more time. Apply conditioner throughout your hair, from root to tip. Let it sit covered with a plastic cap for 10 minutes and then rinse it out with cold water. Scrunch any excess water out with your hands and put a towel around your neck to keep dry. Generously spray detangler throughout your hair, gently pulling it through your curls with your fingers as you go. Comb sections of your hair with a wide-tooth comb to smooth out any kinks or tangles. If you get to a knot, don't yank on the comb. Instead, spray more detangler on the area and gently pull apart the knot with your fingers. Part 1 1/2-inch sections of hair, one at a time, and apply a styling cream or curl butter to each section. After you apply the product to the section, twist or braid it. Repeat this step until all the hair is in individual twists or braids. Wait for the twists or braids to dry completely. Air-drying is suggested to preserve moisture, but you can sit under a hooded dryer to reduce drying time. After your hair is dry, untwist or unbraid the hair. Gently pull through the hair with your fingers and admire your new loose and defined curls. When washing your hair, shampoo with 100 percent sulfate-free products for a glossy finish. If your hair tangles easily, you can apply a treatment mask with the conditioner to aid in loosening the hair. If you untwist or unbraid the hair before it is completely dry, your stretched curls won't be defined and may appear frizzy. Essence Gant writes articles for the female audience, with expertise in style, beauty and health. Her work has been published in "Hype Hair" and "Today's Black Woman Style Report" magazines. She received her Master of Social Welfare from State University of New York at Albany in 2011. Gant, Essence. "How to Loosen Your Curl Pattern." Synonym, https://classroom.synonym.com/loosen-curl-pattern-10915.html. Accessed 18 April 2019.